For the horseshoe to grow larger, it must molt and shed its shell. These "molts" can sometimes be found near tidal flats, left by the juvenile crabs who live there for their first year or two. The horseshoe molts several times during its first year and may reach a width of about 1/2". After its third or fourth year it sheds its skin annually, sometime during July or August. The appearance of the cast skins on tidal flats and in the beach wrack indicates that the larger specimens molt later in the season than the younger ones. The larger, annually-molting animals instinctively seek the areas along the edges of tidal flats and dig in prior to molting. Burying protects them from their enemies-birds, fish, and crabs. The moist substratum supplies water at all times. Molting is preceded by the formation of the new skin; it is recognizable externally by the deeper olive-green coloration of the larger animals and the yellow margins and ridges of the shell. The new skin is formed in pleats so it can fit within the old shell. When the horseshoe molts, it begins by taking in water, which expands and unfolds these pleats and allows the crab to split open its old shell and emerge. It is the valleys in the premolt skin that gives the hardened exoskeleton (shell) its dark-lined mosaic appearance. Observations in aquaria indicate that molting proceeds very slowly at first. Once the animal has emerged about one-third of the way, however, the molt proceeds more rapidly. The duration of this emergence is related to the size of the animal. The first-tailed stage emerges within an hour but an animal 100mm. in width may require over twenty-four hours to completely emerge. Growth, as in most arthropods, occurs step-wise. The animal grows within and ultimately fills its new enlarged exoskeleton, only to repeat the process again and again. 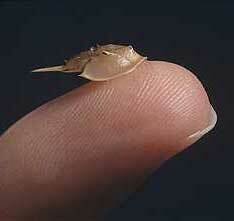 As far as we know adult horseshoe "crabs" do not molt. Measurements of the linear dimensions of the growing animal show that the increments of growth generally decrease during the life cycle, after an initial increase. For example, the width of the first-tailed stage is 45% greater than that of the larva, 75% in the next stages, but then decreasing step-wise to only a 15% increase in width in the twelfth stage.